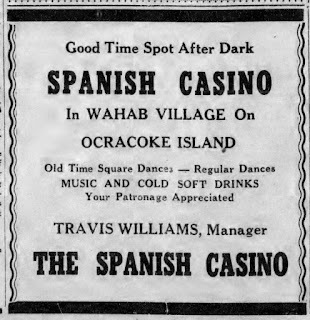 In 1935, Ocracoke resident Stanley Wahab built an inexpensive replica of a Spanish style building on the island, near where the Back Porch Restaurant sits today, to be part of his larger operation which included the Wahab Village Hotel (later renamed Blackbeard’s Lodge). 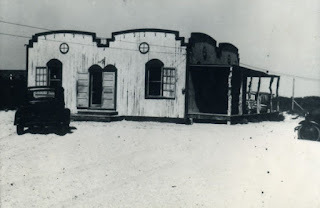 Made of plywood strewn with gravel while the earth-colored paint was still wet, the 400 square foot Spanish Casino mimicked an adobe hacienda. The flat roofed structure had extended and crenulated exterior walls with gently curving main sections. Windows were topped with decorative trim, and crosses within circles painted near the roof line suggested a southwestern theme. An open porch on the ocean-facing side was supported by peeled cedar posts, adding to the Spanish motif. The interior of the Spanish Casino was one large room with a raised platform on the western wall to accommodate a piano and musicians. Benches were placed along the walls, leaving a sizable dance floor in the middle. Island natives, Edgar and Walter Howard, brothers who had moved to New York City to play vaudeville in the 1920s and 1930s, came home periodically to entertain their fellow islanders. The popular music of the day included cowboy and western songs and ballads. Once in a while Edgar’s banjo and Walter’s guitar accompanied nationally popular entertainers who followed the Howard brothers to Ocracoke. 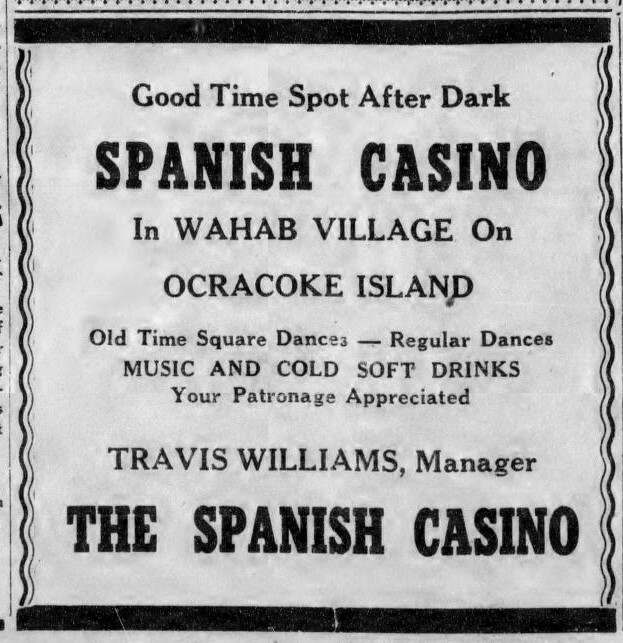 At times, other island musicians played at the Spanish Casino. When live music was unavailable a jukebox served nightly to provide tunes for round dances, jitterbug, and traditional island square dances. Stanley Wahab included a small canteen to serve his customers. Candy, cigarettes, and soft drinks were popular items. Eventually the Spanish Casino also offered hamburgers. Some years earlier, under the influence of Mr. Shaw, one of the Methodist preachers, sales of alcoholic beverages had been banned on Ocracoke Island. It was a rare night, however, when homemade meal wine did not flow freely behind the building or on the other side of the sand dunes. I always find it so interesting to consider the village's changing look over the years. To imagine that area as "facing the beach" is just fascinating. I am also amazed at how much activity went on through the years on the island. A few key characters certainly made Ocracoke an interesting place in every generation! Thanks for yet another interesting gem of history. Now meal wine is not made from meal worms, right? That was my first thought when I read of meal wine on this blog. Meal worm wine, ugh! Meal wine as in table wine, house wine an inexpensive wine to serve often. Now the fact it is consumed behind the casino, or down behind the dunes without a Meal-- I am assuming it is a popular beverage. Now is there any speculation as to the Alcohol content of this meal wine? And in true NC convention, were there ever any stills on OI? No, there are no worms in meal wine. I have published the recipe in past posts, but I will publish it again soon. Stay tuned! I am not aware of any stills on Ocracoke. Hackers and evil forces most often hacks the net casino site and therefore, you need to ensure that the casino you happen to be buying, provides a safe and secure platform for gaming and also for the transfer of funds.